This weekend, Cannon County men and women who have fought for the United States will be honored for their bravery, dedication and selflessness during ceremonies at Cannon County High School and in downtown Woodbury. The determined men and women who defended the country to protect its freedom are Veterans who will be recognized for their contributions as part of Veterans Day 2011 activities. 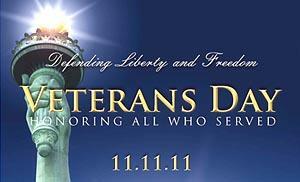 Veterans Day is held each year on Nov. 11. "Veterans Day is about as important as anything I've got under the good Lord, with Him being No. 1," Col. Jim Stone said. "If you think about it, we live in a wonderful country and this freedom we enjoy is because of those Veterans. If not for them protecting this country it would be under some dictator like they are in many countries in Europe. We have freedom because of the men and women who stand up for it." Sixty-one Cannon Countians have died while protecting and defending the United States, including 22 in World War I, 36 in World War II, one in the Korean War, one in Vietnam and one in Operation Iraqi Freedom. Cannon County's Veteran's Day activities begin with a ceremony at Cannon County High School at 8:30 a.m. Students have built a mock-monument with all the names of fallen veterans similar to the actual monument at the Courthouse Square. The names of fallen veterans will be read to the student body. State officials also will be in attendance. At 11 a.m. Friday (11/11/11), the names of fallen Cannon County war heroes will be read during a ceremony on the Courthouse lawn. The annual Veterans Day Parade takes place Saturday at 1 p.m. in downtown Woodbury. While these ceremonies remember Veterans who died defending America, Veterans Day also is to salute those who served and survived. Their contributions are as important. "Veterans Day is a great day," Woodbury Mayor Harold Patrick. "It is good to have a day to celebrate and honor all of our Veterans, which is really something we should do every day. Ours has been a great nation and one that has inspired greatness and much of that is due to the men and women who have served to protect our freedom." 1st Lt. Frank Walkup IV, a Cannon County graduate, lost his life while serving in Operation Iraqi Freedom in 2007. His mother, Mitzi, said the outpouring of patriotism for Lt. Walkup was overwhelming, while also pointing out Cannon Countians are highly supportive of Veterans on a regular basis. "There is a lot of patriotism in Cannon County," Mitzi Walkup said. "Veterans groups have done, and continue to do, a lot to support all of the Veterans in Cannon County and that makes you very proud." Because of changes in technology, both parents working, and other day-to-day responsibilities, people get caught up in what they are doing and have a tendency to forgot. Veterans Day is provides an opportunity for all Americans to remember those who have served, as well as those who continue to serve. "We have a wonderful Veterans Day celebration," County Executive Mike Gannon said. "Our Veterans are so important. Cannon Countians have played a role in helping protect our nation's freedom and their patriotism is what we celebrate." Jennifer Duggin witnessed Cannon County's patriotism first-hand while serving in Iraq in 2009. "This town was amazing while I was deployed," Duggin said. "I never knew there was so much patriotism in this tiny little town. The care packages just kept coming, not just for me, but to give to those who didn't have anything. There were 100 packages waiting when I came back from Thanksgiving." Duggin was one of many Americans who made the ultimate sacrifice by leaving children behind when re-enlisting in the military. She originally joined in 1991 and served until 1999. Duggin, the mother of a young son, Will, re-enlisted in 2006 and was deployed to Iraq in 2009. She presently serves full-time at the Tennessee National Guard in Tullahoma. Duggin is reminded of Veterans daily. "We have a flag pole in our front yard and every day when I'm leaving or coming home it is the first thing I look at," Duggin said. "It is very patriotic at our house. My children are very proud." It is with that pride America celebrates Veterans Day, 11/11/11. Samuel Bailey, Cherry M. Barrett, Clay Bucey, Eath Bush, Malcolm Cooper, Colonel DeBerry, Huston Dobbs, Burley Elrod, John W. Fugitte, Hugh Wiley Gunter, John Earl Hancock, Albert Higgins, Calvin Higgins, Matthew D. Keaton, Oral King, Drennon Meritt, Jesse Miller, Floyd E. Mooneyham, Robert A. Nichols, Willie Lee Owens, John M. Starr, Grover C. Todd. Alf Barrett, Georgia D. Bell, James W. Borren, John Bowen, Warren Crim, William E. Davenport, Earon D. Duke, Florst E. Ferrell, James C. Farrell, Donald Francis, Parmer R. Gunter, Wilber Hayes, Medford Howse, Willis W. Jernigan, Ray Mabe, Avent Muncy, Charles Muncy, Troy Murphy, Lessie L. Nokes, Hoyte Parker, Adam G. Pelham, Robert D. Pendleton, Lloyd Perry, Cecil R. Reed, Howard M. Rogers, Horace F. St. John, Leonard Simmons, Estyl Smithson, Truman I. Thomas, Milburn Travis, Walker Lee Vandygriff, John H. Vinson, Tillman Willard, Fred Wooten Jr., John D. Wright., James H. Young. • Veterans assemble by Service Branch in the center of the Gym when your service song is played by the CCHS Band. • After all service branches are assembled Veterans line up and pass the microphone, give your name, rank, time and place of service (students be looking for that special Veteran you plan to pick at the conclusion of the program). • A must see – Walk through the school to see the decorations, Art work, Photography, & the Wall of Honor (for our men and women serving in the military today). Friday, November 11, 2011 at 11:00a.m. • Our Service Grand Marshals- Army Air Corps, Austin Jennings-Army, Lonnie M. Mooneyham-Army, Grady s. George, Sr.-Navy, Martin Tochholke-Marine, Joe Hawkins- Air Force, Keith Daniels- Coast Guard, Robert Virgil Young-Concerned Citizen, Mary Nelle Ruhl Hillis-POW-MIA Grand Marshal, Louie Hillis. I really appreciate the efforts respecting our Veterans. I still have memories of the war protests and the disrespect displayed toward returning vets during some very difficult times. I thank every person that has served and especially those still serving protecting our freedom. To fight for your rights, to fight to enjoy freedom is a very honorable fight.